MK8 port (as well as other ports from Wii U) was a no-brainer and expected by everyone in these threads here long before ARMS was even announced. Wii U underperformed as hardware but its software was high quality and the NX always was expected to expose more players to some of the Wii U games. We saw this actually happening with MK8D and Splatoon 2. Now Pokken joined and the main reason why there's no Mario Maker for Switch yet is that it's already on 3DS. Nintendo explicitly stated they're considering more Wii U ports for Switch too. Thanks to the Wii U library, which still has room to grow on Switch, Nintendo has their hands free to do more new IPs. Which they've always done but they were spread among two systems and the established IPs requiring new installments limited how much other projects they could work on. New IPs are more interesting, both for players and devs. I don't know what new gameplay mechanics you even expect for yet another kart racing game. A new F-Zero would be more interesting than MK9 (only problem being, it wouldn't sell). In case you're fine with more racing tracks for MK, there's always DLC for that. I should add I know they're working on DLC for ARMS. I'm wondering what they're thinking as far as their next video game. What's the problem? If they really can't get new people in FFXIV, it's time to port it on other platforms, thing that S-E already said that they wanted to do. Only major blocker for them was crossplay, which is now obviously an issue with Sony. What you said could be interpreted that Sony was blocking them from porting the game to other platforms (if not directly, at least indirectly), which isnt the case. Square Enix has soon Dragon Quest X on Wii, WiiU, 3DS, PC, PS4 and Switch. If they can make that happen, the same can be done with Final Fantasy 14 too. DQX for PS4 won't have crossplay. I thought about what a meaningful new MK could be. Since there are RPG modes to tennis and golf games, why not have an open world MK RPG? There would still be regular circuits but they'd be located in a larger world and you could explore towns surrounding the circuits and drive your kart from town to town. It will actually. I also was under the impression that in the case of FFXIV the problem with bringing it to Xbox was with MS. It's a crossplay, but not cross pay. Same character can jump in and out all PS4, PC, WiiU, etc. and play together in the same server. But the subscription fee for PS4 in "DQ point" only (buy via PSN JP) the same as subscription fee for 3DS was eShop (Nintendo) only. FFXIV was the Xbox problem. But yet the game exist on PS4 despite Wii, WiiU, 3DS and PC having cross play (if i'm not mistaken). Wont the PS4 have any cross play by the way? I tried to search on Google, but couldnt find anything. Microsoft required separate servers iirc, which was a sticking point for SE. No idea if that's still the case or not, I'd guess no given their recent policy relaxing. The issue with your post is that it doesn't make much sense the way you put it/word it. First, you pretty much imply that it is Sony's fault for not bringing the game to other platforms or blocking some things (like what?crossplay? ), which is not true since Yoshida said numerous times that he wanted to have the game on Xbox but he couldn't due to Microsoft's restrictions. Second, i don't understand how Stormblood is gonna bring new people, when it's main purpose is holding the existent subscribers which is the biggest problem that any MMO that requires payment has. In the end, FFXIV is a 2010 game (2013 if you want to count after a ARR) that is available on PC and Playstation, thus covering the biggest % of fanbase and it's on third expansion so a decline is expected although i imagine that most people will buy Stormblood on digital. Capcom is having fun counting the millions of views of Monster Hunter World Trailer. The video passed 10 million views worldwide according to this tweet. Capcom Japan has 2,5 million right now for the trailer. In a few days, it should be ahead of MH4G (2,6 million) and MH4 (2,7 million). Prodigy and I looked that over last night. The MHW views are potentially bots (or something very screwy is happening) a lot of ad views and inorganic. We cross checked various E3 vids from 2016 and 2017, and that view to like ratio is a massive red flag. There are two scenarios: the video is being bot farmed for views, or Capcom is running that trailer at least 7:1 or upwards to 24:1 times per actual sought out YouTube view. 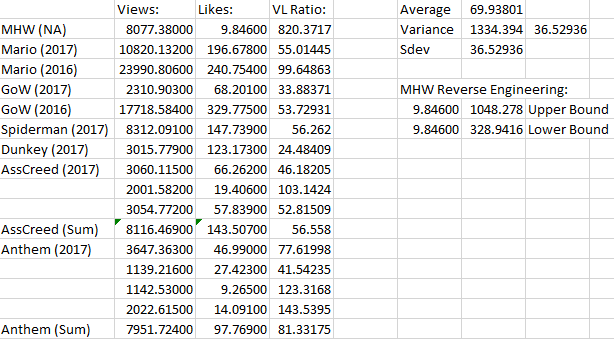 The likes and using other E3 vids as cross reference for a View:Like ratio reference is on average 70:1. MHW US trailer is >800:1. If you actually scale it's likes to "real" views, it's between 1mil and 300k. Math says something's fishy. That's too far outside of the sdev (its damn near the variance) and an order over the mean. Ah, thanks for the details, I just remember S-E talking about crossplay and patches, not servers. My point is that the first two are definitely confirmed for not being an issue for Nintendo and MS nowadays. For the rest, obviously, but an MMO goal is also to get new audiences to save up from those leaving. When you release an expansion, it's to get a boost from older players coming back, but also new ones coming in. Prodigy and I looked that over last night. The MHW views are bots (or something very screwy is happening). We cross checked various E3 vids from 2016 and 2017, and that view to like ratio is a massive red flag. YouTube are very fast in capturing bot traffic. Wow at that MHW youtube views analysis. I have a paragraph on ads. But even that seems nonsensically off-kilter when I am sure the other E3 vids, especially the ones referenced in the snippet, are likely also seeing heavy ad runs. And yes, I know bot policy on YouTube. They are just doing Ads with the trailer , i think. Unlikely that the views for MH World are from bots. Probably it's ads or the fact that fans have seen the trailer numerous times! I already watched it more than 5 times! Prodigy and I looked that over last night. The MHW views are potentially bots (or something very screwy is happening). We cross checked various E3 vids from 2016 and 2017, and that view to like ratio is a massive red flag. I have seen the MH video probably over 20 times as an ad. It's probably the most common gaming ad I've seen since E3 with Xbox One X being the second. All the rest of those games aren't ad videos. Nightingale in the E3 2017 youtube views thread said the same thing: the view to like ratio is several dozen times larger than for other videos, and he thinks it's due to running the video as an ad (and he points to other vids that we know are run as ads that have a similar view to like ratio). Fans would have to watch the trailer an average of more than 11 times, which I don't think is feasible. Ads is the best explanation. Regardless of how it actually got there (bots, a crazy number of ads, or fans having it looping 400 times), the main crux was that the video has only (based on analytics of other views) been sought out ~300 to ~1,000 thousand times. I had thought Anthem teaser was one such since I had actually seen it, but even it is ~100:1. But if there are reference points that I don't know then that's super neat! If you look at the view/like ratio, it stands at 0.12% for the main MHW trailer, which stands for heavily ad-run inflated. They are views that are being watched, but they aren't organic growth where people are actively searching for the trailer and watching them on their own volition, but are being served as advertisements instead. In general, one can be skeptical of anything with a V/L ratio below 0.5%. I see that XB1X has a similar ad ratio so then that does seem to strongly suggest massive ad run. To be clear, this is about the 8 million views video on the Monster Hunter channel but not the one on the Capcom Japan channel, right ? The first one is indeed absurdly high if you compare to the rest of the channel (no other video ever got 2 million). The japanese one however has a huge amount of likes compared to similar trailers on the same channel. As for the streaming 2 days ago, I don't have point of comparison but I saw close to 100K viewers at some point. No idea how it compares to others japanese stream though. The one on the Japanese channel is fine, actually. Doesn't seem that one gets run with any heavy ads at all and the views are organic. There aren't many other Wii U games that were held back at sales because of low install base. Only Tropical Freeze has remains. Everything else is ported to 3DS and Switch. "Until recently, we were usually in the mindset that because we're in Japan, we'll develop games for Japan," Morishita said. "And if it does well, then we'll bring it to the West. But moving forward, what we really want to do is make content for a global audience with worldwide releases at the same time." GungHo has two big reference points when it comes to taking its big hits global: Ragnarok Online and Puzzle & Dragons. Neither has quite duplicated its domestic success internationally, but there are still lessons to be learned there. In the case of Ragnarok Online, one could point to its aesthetics and gameplay not being as popular in the West, but Morishita feels Puzzle & Dragons' gameplay design is more or less universally appealing. So why isn't it a phenomenon on the same scale internationally? "The biggest thing looking back on what we could have done better is making it a global launch," Morishita said. "Due to the staggered release dates, the update schedules are also staggered. The P&D global game is slightly behind Japan in that sense... Then there's a gap between communication of what we have with our [Japanese] users and then users in other regions. And then our users start feeling somewhat negative, 'Oh, we're always going to be behind Japan.' And that might heavily affect our users' interest in our products when they see these differences." Morishita pointed to Let It Die as a good example of the company's efforts move to a more global viewpoint. The game actually launched in North America and Europe first last December, and followed in Japan in February. Last month it passed 3 million cumulative downloads, with the largest chunk (one-third to one-half of users) in North America, and the next largest player base coming from Europe. They can still port games that are already on 3DS to Switch as well. Mario Maker and Smash 4 would be good additions to the Switch's library. Also other minor games, just to bolster the library. But yeah, the games with the biggest expected increases are already there. It's still not selling 2 million copies. Ki. Will it even outsell Splatoon? How many views did that game get? i'd have made the same sort of gag if I could've remembered who it was lol! Just a quick request. Whoever decides to make a new thread for the Switch passing 1 million in Japan, please provide context and maybe even charts comparing the Switch to other systems. Those threads always lack the necessary information in the OP. I guess Oregano is on a vacation again. What will we make of these threads now when we can't discuss the lack of third party support for the Switch. The kirby Wii U game too. Smash and Mario Maker have already reached broader audiences since they were released at both Wii U and 3DS. With none of these two making it this year I think next entries will be more than ports. As for low sellers Nintendo so far hasn't showed interest porting any of them, either they come from Wii U or 3DS. Nowhere in the press release does it say the game they're developing for Switch is Medarot. It could be, but it could also be the shovelware mascot games they've been pumping out on 3DS for a while. They mention that this year marks Medarot's 20th anniversary but they also mention some of their other games, like a kanji teaching series. That's more of a summary of their history in the games industry. I find it difficult to believe they'd shutdown the development studio behind the mainline 3DS Medarot games to work on a more expensive Switch game from scratch only a year later. Ah apologies, I never viewed the original source, someone passed me the link stating "Medabots is coming to Switch" and I stupidly just took their word for it after clicking the link and not reading properly, sorry for the misinformation! I still believe a SSB port with both 3DS and Wii U content would be necessary in order to make the platform even more attractive to the fighting game community and in order to continue and (possibly) improve the current eSports push that we've seen starting from this E3, with the three invitationals and NintendoVersus' opening. Certainly Tropical Freeze is another great candidate: a fantastic game that unfortunately released on a badly performing platform and before Mario Kart 8's release (that was the time when Nintendo games in general started selling better on it). Personally, I'd love to see Bayonetta 1+2 on Switch, I believe they would get another chance at selling (especially Bayonetta 2), but it's also true its sales potential is far lower than other candidates, unfortunately. Also, if we can mention potential Wii-to-Switch ports, I have something in my mind that no one on this board has imagined yet. What about...a Metroid Prime Trilogy remaster?!? What a great idea! I'm totally going to create a thread about it right now! I am curious about what they do with both Smash and Mario Maker. I think the assumption going into Switch was that there was a Smash 4 port and Nintendo would get Smash support on Switch quickly in that manner. They're managing to get all their other core multiplayer (which are also evergreen) series on it in the first year, with Smash being the odd one out. I wonder if we do see Smash next year to complete this initiative. But...that'd seem too late for a Smash 4 port, perhaps? Also would be fairly quick turn-around for Smash 5 going by Brawl to 4. Still, 4 years. So not impossible at all. Also worth considering wrt this is whether, say, Animal Crossing, Pokemon, and 2D Mario make it next year too, as Nintendo is also putting out two of its big, single-player evergreen titles this year (Zelda and 3D Mario). Are they indeed trying to get all such titles out within the first year and a half +? Mario Maker more as to being a fan of the first and curious about how they handle the touch screen. I think Nintendo would be pretty foolish not to release the Prime Trilogy on the Switch. It's been 10 years since MP3 released on the Wii, and the GCN games are even older, so a lot of people that are gaming now have never even played them. I believe they should release it physically as well. Not only would it build hype for MP4, but it would be a fairly easy title to help fill out the release schedule. you are not serious, right? No matter how many Youtube views it gets, it won't outsell Splatoon in Japan. I wonder if a Switch Sports could be successful. Wii Sports Club, Wii Fit U and Brain Age flopped, but the Wii U is the Wii U, Brain Age was Brain Age but in a mobile gaming boom, and I think there can still be a sizable audience for party sports games beyond the Wii. That game fits Nintendo's strategy "it didn't sell well at any territory before, it doesn't worth the effort porting it". Wii Sports Club even required a remote that wasn't packed in with the Wii U (everyone was supposed to have one but that's besides the point). On Switch it could use the always on Joy-Cons, and be portable to boot. Don't care much about Wii Fit or Brain Age, but I'm dreaming about Wii Sports on Switch. I'd rather Nintendo turn those sports in Wii Sports and Wii Sports Resort into separate fully fledged games like ARMS. Think of it this way, ARMS makes it unnecessary to have Wii Sports Boxing. The motion controls in ARMS make the game accessible to audiences and has game modes that appeal to both competitive and non-competitive players with Party Mode and Ranked Matches. So in that sense, I'd rather have a full fledged bowling game and tennis game since there's not much they can change creatively with Wii Sports other than add more sports. Brain Training should just be put on mobile since it doesn't seem like the kind of game to have on Switch. The Biased Gaming Media stanning for Nintendo did him in. Switch Sports could be a huge thing. Maybe a new art style. The Wii U did not come with Wii Remote style controllers, what a mess that system was. 1 2 Switch is underperforming. Switch Sports wouldn't get anywhere. One million, here it goes!